Best solution to an awkward design? For a Desktop application. Designing this page to add teams and assign players to the teams added. More, allow users to edit teams on the same page. First: Add a Team. Second: add players to teams and Save all. Third: Allow Editing. User enters the team name and team info and click Apply button. The Team name gets added to the Drop-down list (Teams), and the Players list on the left populates all players available (they were added using different option). User selects players from the left list and add them to the list on the right (Players in Teams), then Click Save button (Will save in the database). Now, the issue is when the user comes back to Edit a certain Team. 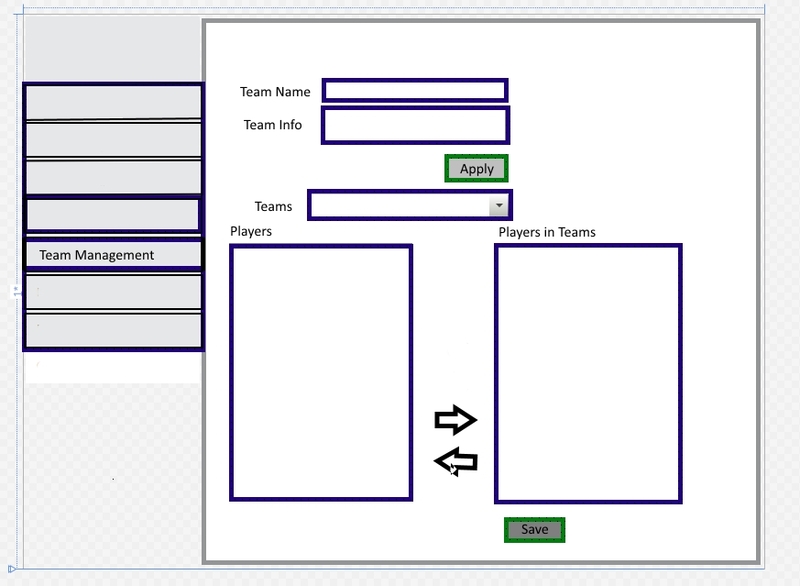 The user has to start by going to the middle of the page (Awkward), to the "Teams" drop-down list and select a team, the Team Name and Team Info text fields (on top of the page) will be filled out. User can change them, and can add or remove players from the list and click Save button again to save changes. I am trying to keep both functionalities in one page. Creating two separate pages (or tabs), one to Add new team, second to edit will fix it. Moving the Drop down list to the top of the page before the text fields (New Team and Team Info) is one way to somehow make it work better. Still not ideal unless someone can provide a way to make it flow naturally. Any ideas on how to fix this design? make it flow naturally? Any idea is very appreciated. Thank you! 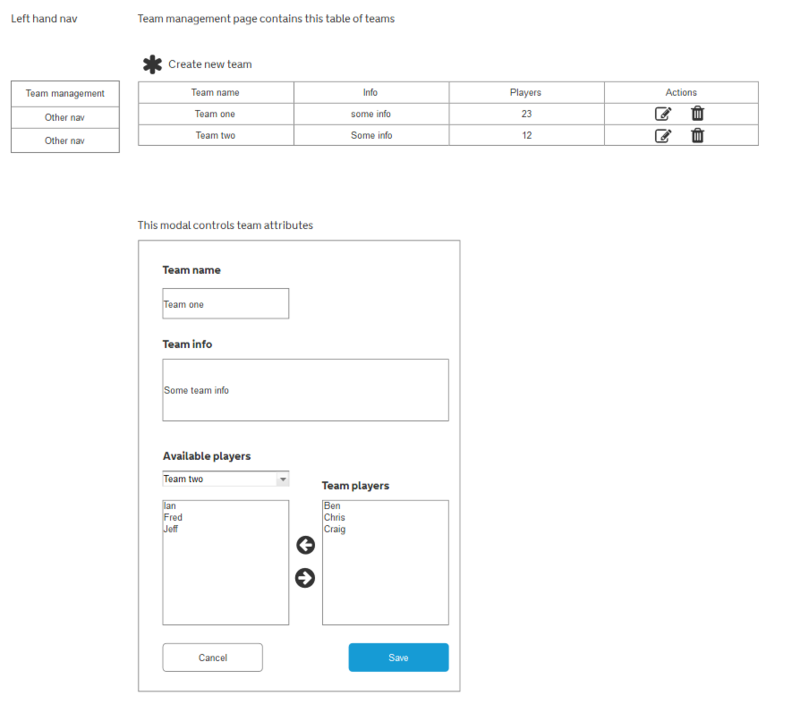 Left hand nav is a navigation menu and on the right is a page for team management that contains a table of available teams. You can create new teams or edit or delete them. When you edit or create a team a modal appears that lets you control certain attributes of the team such as name, info and who plays for the team. Not the answer you're looking for? Browse other questions tagged desktop-application or ask your own question. Is there ever a circumstance where the user should be notified of a user interface no-op? How can the Copy and Replace message box be improved? What's the best way to allow a user to revert an input field to a default state? Save As Template button, if application criteria changes, should the changes also be saved on Save As Template click?